Thank you Marjma2014 from Kyrosmagica for nominating me for this award. Her blog is all about books, magic writing and fun in general. If you are a writer yourself or want some info about the whole process you will definitely find something there you might need. There are tons of articles about tips for writing and a lot more so check it out. I am honored for receiving this award as I basically only picked up blogging in order to write down the crazy stories of my mother-in-law and the rest of the family. I am doing this already now for over two years and still don’t feel bored with it so I hope to give you more funny stories in the upcoming years! RayHecht by, guess again who! Ray Hecht! Congratulations, Crazy! An award for you, well deserved. I have thoroughly enjoyed reading about your Chinese family, MIL and vacations for these past two years. Always entertaining and you write very humorously. Thank you for reading my blog already for a such long time! I can’t believe it’s been two years already. Keep up the posts, maybe you have a talent for comedy 😛 And thank you for always coming over mine for a read. Congrats, Timo! I love reading all about your crazy MIL adventures, your family adventures, and it is so awesome to watch Nathan grow through your blog. 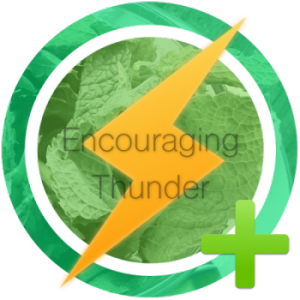 Encouraging Thunder… that’s a funny name for an award, haha. Hahaha! Let there be an encouraging thunder of applause! Love all your nominees too!! Congratulations! You deserve that award!